The young, hipster aesthetic of Stubb’s Bar-B-Q and high-quality equipment combined with the open feel of the space helps to create an authentic Austin music going experience. 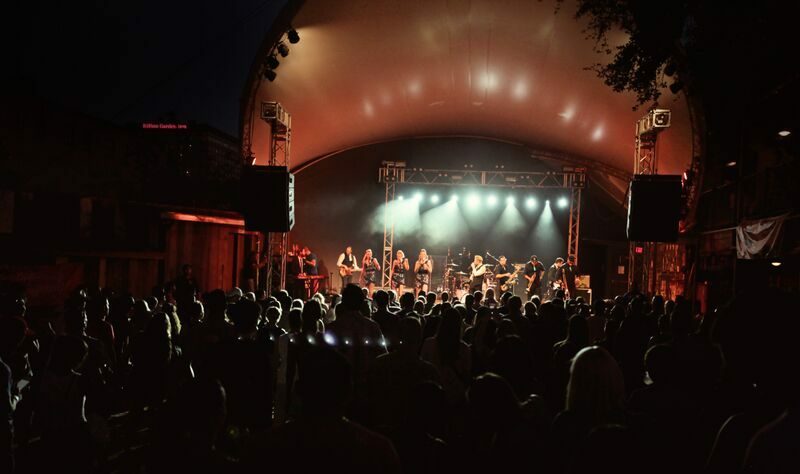 Having been to other venues in Austin such as Emo’s, Carousel Lounge, Elephant Room and Empire Garage, I have experienced a fair portion of what Austin’s music scene has to offer. However, no venues have impressed me as much as Stubb’s Waller Creek Amphitheatre. Stubb’s Bar-B-Q was founded by C.B. Stubblefield, a veteran who opened up the first incarnation of Stubb’s in Lubbock, Texas. There, the restaurant hosted many great musical icons such as Joe Ely, Jimmie Dale Gilmore, B.B. King, Willie Nelson, George Thorogood, Stevie Ray Vaughan, Muddy Waters and Tom T. Hall. Stubblefield relocated the establishment to Austin in the mid ‘80s. The company thrived and flourished in Austin, contributing to the establishment of Austin’s “live musical capital of the world” persona. A year after Stubblefield’s death in 1995, Stubb’s reopened at 801 Red River Rd in Austin as a restaurant and live music venue which would serve as one of the most influential music venues in Austin. Today the venue has hosted artists of the likes of James Brown, Snoop Dogg, Foo Fighters, Cold War Kids, Metallica, Willie Nelson, R.E.M. and Ween. My first visit to Stubb’s happened after a friend of mine invited me to a Jon Bellion concert with him. Bellion was an artist that I had not heard of, so I reluctantly agreed, but found myself anticipating the event as we rode to the venue. When we arrived, we were greeted by a line that stretched out the door and down the street. Somewhat disgruntled by the sheer number of fellow attendees, the two of us walked down the seemingly endless line, but surprisingly found a group of three friends already waiting in line and joined them. Together we waited in line until eventually arriving at the doorsteps of Stubb’s. I was pleasantly greeted by an old wooden exterior that projected a homey and vintage vibe, as well as harsh looking security guards. Upon my entrance I was immediately struck by the smell of cooking brisket. After further inspection, I was also surprised by the lack of trash and the overall care and management that clearly went into maintaining the the Waller Creek Amphitheatre. The amphitheatre has an upstairs and downstairs bar, along with an upstairs patio for VIP. The amphitheatre itself was a fairly large structure with an overdrop hanging above the actual stage. The Bellion concert also featured Travis Mendes and Blaque Keyz, two hip hop artists who collaborated frequently with contemporary and alternative artist, Jon Bellion. The show was visually spectacular, courtesy of the stunning stage and lighting system used at Stubb’s. The show featured a fantastic and authentic performance using both the incredible facilities, as well as an incredible artist, to tell their story more cohesively and visually appealing. From beginning to end, the combination of the act and the facilities that supported him managed to capture the crowd, leaving myself and many others enamored. The venue was superior in that its advanced audio visual production equipment managed to create an ambiance unrivaled by any other venue I’ve been to. The facilities were clean and exceptionally outstanding, especially in comparison to other venues. The dome shaped structure of the amphitheater allowed for better sound projection and reception. The event staffers even after noticing how hot that most of the crowd was began distributing iced cold water which earned them a lot of points in comparison to other venues who sold overpriced water. Overall, an enjoyable experience I’d gladly revisit again.